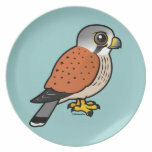 The Common Kestrel or European Kestrel can be found across Europe, Asia and Africa and sometimes even reaches the east coast of North America. 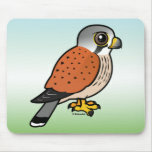 It is small compared to other birds of prey, but larger than most songbirds. 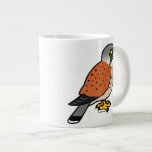 It is mostly brown with dark spots and males have a blue-grey head and tail, while females have a brown tail with black bars. 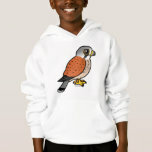 When hunting, the Common Kestrel hovers about 10 to 20 meters above the ground, searching for prey. 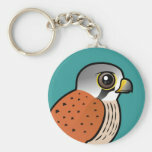 Once prey is sighted, the bird makes a short, steep dive toward its target. 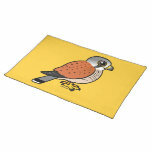 They can often be seen hovering by highways, looking for mice, voles and other small rodents. 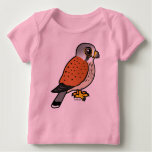 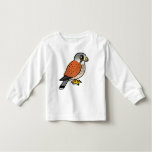 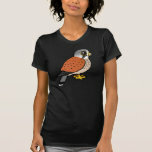 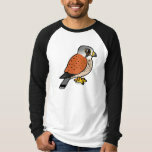 This is our totally cute Birdorable version of the Common Kestrel!